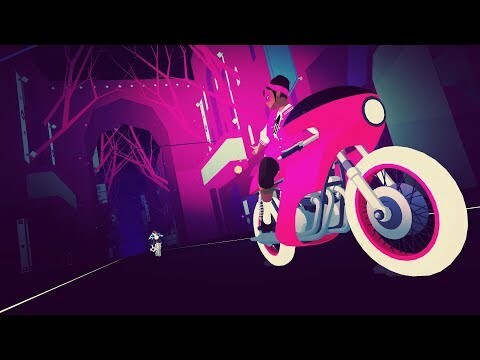 Sayonara Wild Hearts is a euphoric music video dream about being awesome, riding motorcycles, skateboarding, dance battling, shooting lasers, wielding swords, and breaking hearts at 200 mph. As the heart of a young woman breaks, the balance of the universe is disturbed. A diamond butterfly appears in her dreams and leads her through a highway in the sky, where she finds her other self: the masked biker called The Fool. Traveling through futuristic cities, dark forests, and electric deserts, The Fool sets out to find the harmony of the universe, hidden away in the hearts of her star crossed allies: Little Death, Dancing Devils, Howling Moons, Stereo Lovers, and Hermit 64. The upcoming Sayonara Wild Hearts Switch release date is 2019 in the US and the UK. Notify me when Sayonara Wild Hearts is available.